Fast forward to Thanksgiving, will you? Ok, so it’s happened again. I am weeks behind and I blame technology, even though I settled the root problem weeks ago. Ahem. Basically I hadn’t uploaded photos since I left my job at the end of October. …Happy December! Right. I am remedying that. Meanwhile, um… There was a lot of eating last week. Mom and Dad were here the whole week, and my uncle was here for a couple days, and Thanksgiving was awesome. I recommend it, Thanksgiving. In case any of you forgot last week. Here, I will post some hastily-uploaded photos, because I feel really guilty, and because Thanksgiving is already sort of boring, food-blogging-wise (because who really wants to do anything different from what they have always had, deep down? ), so if I post these any later it will be a joke. I am always so entertained by brussels sprouts. I love them. We made them with pancetta in a recipe that I won’t recommend because they were more bitter than usual, though still quite beloved at the table. Clockwise from top left: Brussels, mashed potatoes, dressing, beans with shallots, turkey. Not shown: Carrot salad, cranberry sauce. My family eats what can only be described as a damn good, sophisticated diet year round. For Thanksgiving we tend to go simpler and keep things really classic. 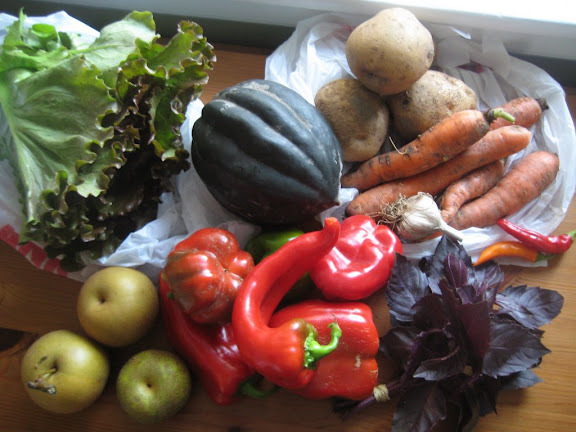 Also not shown: Ben’s annual pies–chocolate cream and pumpkin. The very best part of Thanksgiving, though, is on Friday night, when we make hot turkey sandwiches. Heat the turkey in gravy. Serve over bread you’ve toasted until hard. Agh!@!! 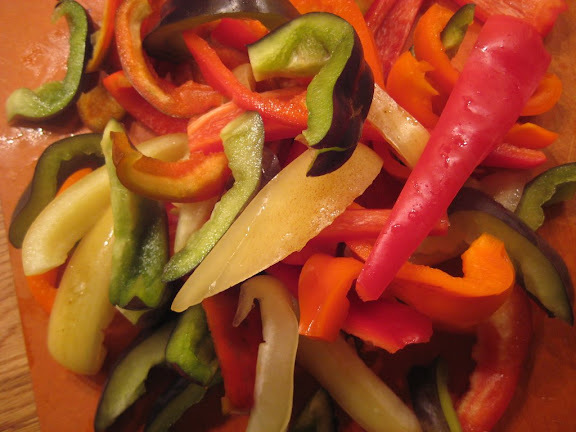 BTW, I’m psyched that WordPress is once again cropping all my photos on the right side. Technology again! Ok, The Best Pasta. 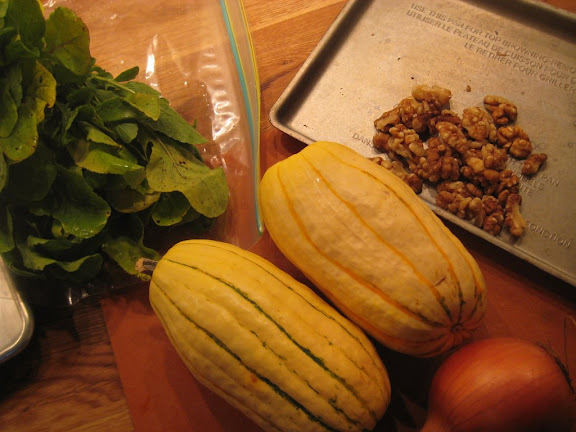 We got delicata squash a couple times in a row, and I was reminded of the pizza I made with it last fall, with walnuts and other lovely things. But I didn’t feel like making pizza, and was leaning towards risotto or pasta until I saw this post on The Kitchn, suggesting a pasta dish with acorn squash and pancetta. It looked tasty, so I went with the pasta urge, though I didn’t follow that recipe. Instead, I made yet another absorption pasta, which even casual readers know I am obsessed with. First I got everything ready to go. I cut and cleaned the delicata squash and rubbed them with a bit of oil, then roasted face down at 425 for about 20-30 minutes, until they were very tender. Meanwhile I heated some olive oil in the pot I’d be using for the pasta and browned the pancetta, rendering as much of the fat as I could (you need oil to brown pancetta, btw–it tends to turn grey, then burn if you do it dry; I think the fat doesn’t render out as fast as American bacon). I pulled it out when it was nice and crispy, then softened my chopped-up onion in the delicious combination of lard and oil in that pan. I am not being facetious; that is good stuff. See the lovely color from the pancetta?? I also toasted the walnuts in the toaster oven and managed to just barely scorch them. 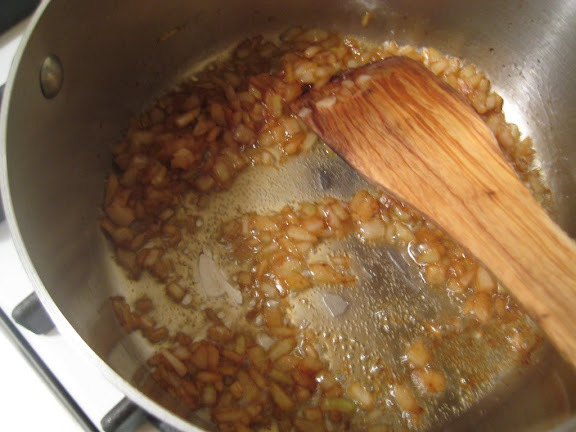 I added the pasta in to the onions and oil, and did the usual absorption thing–add stock, cover for a while, stir, add stock, uncover, etc. I use the covering/uncovering depending on how much stock I have/how fast I want the pasta to cook/how much more liquid needs to boil away once the pasta is almost done. 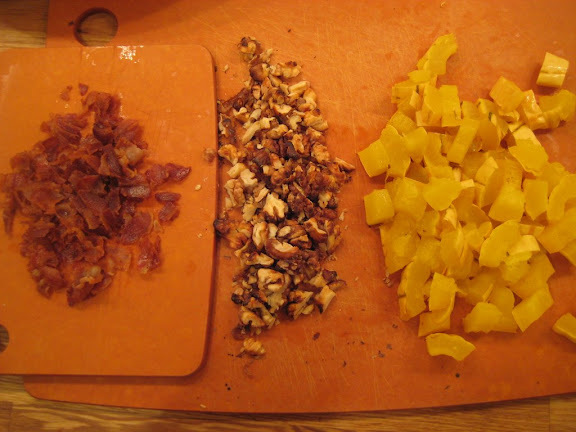 While the pasta cooked I crumbled the pancetta and chopped up the squash and walnuts. 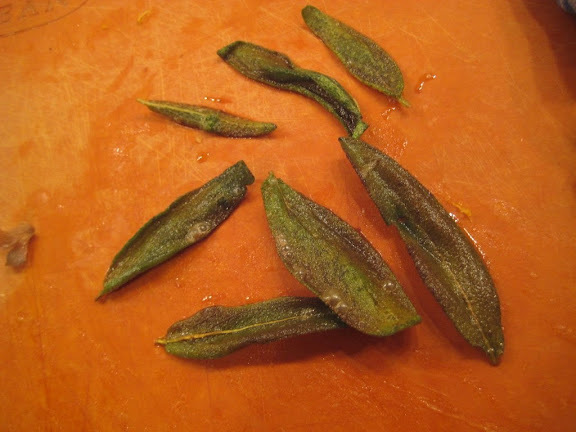 The nice thing about delicata is that the skin is usually so tender you can eat it. 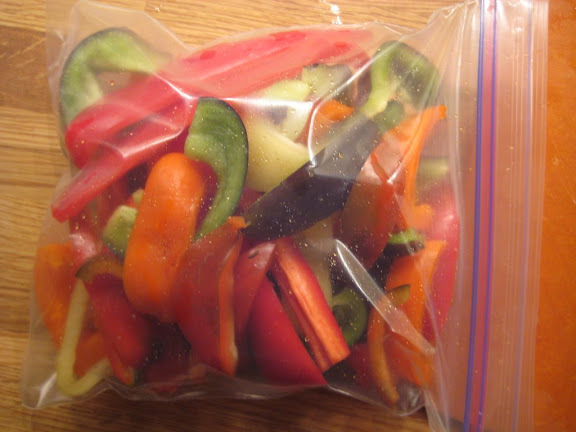 Test a sliver and if it isn’t tough, chop the squash up skin and all! 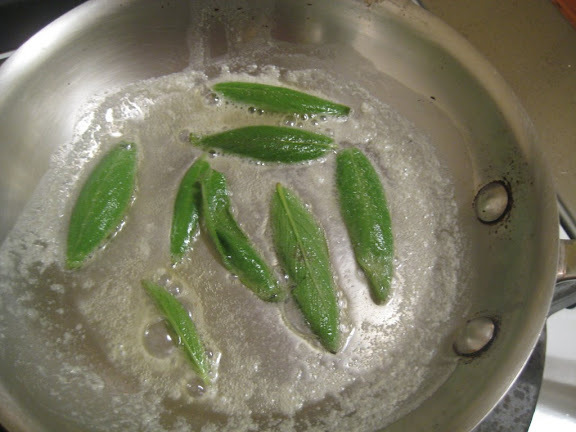 I fried a few sage leaves from the farm in butter, because why not add a third fat source? The more the merrier! 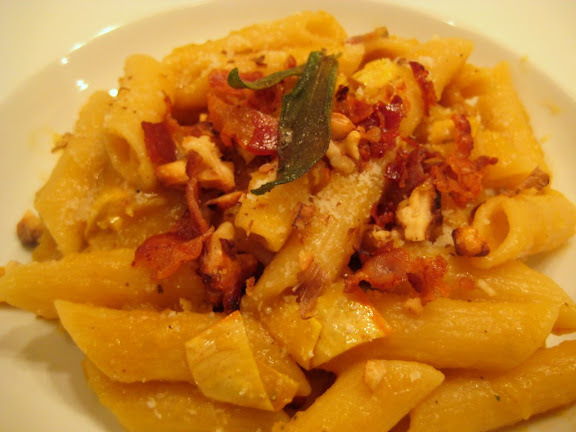 Once the pasta was al dente, I stirred in the chopped squash and about 2/3 of the pancetta and walnuts, along with a couple of the sage leaves, crumbled. I adjusted for salt and pepper, then plated the pasta and topped with the remaining pancetta and walnuts, a little sprinkle of parmesan and a couple sage leaves. 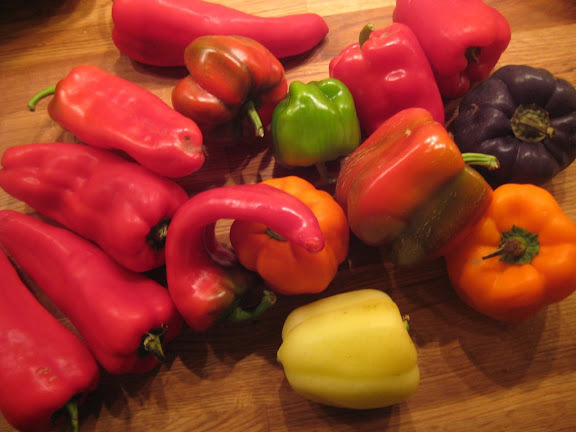 Ben ate them in one workday, so I guess I shouldn’t worry too much about extra peppers, after all. I just clicked on Tom’s Flickr stream and saw this photo of our parents unpacking a picnic on a day trip last week. I miss them and wish I’d been there!